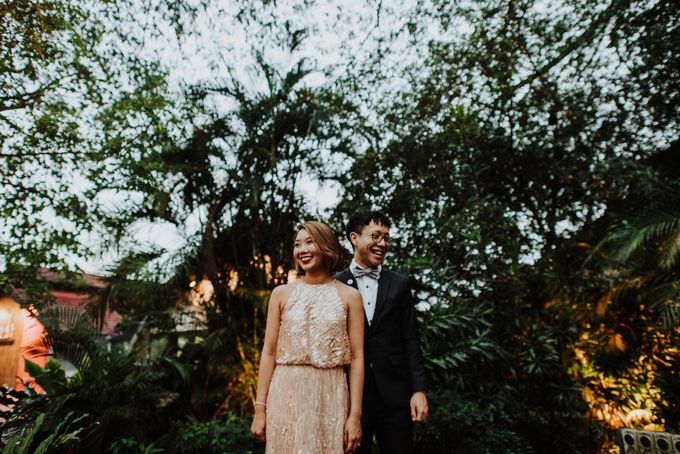 Theme: Wes Andersen Inspired Concept, Florals & Styling: Amperian Venue: Tin Hill Social Photography: Andri Tei Photography Gown (Church): Designed by Bride and made by Nancy of Vega Tailoring and Dressmaking Dress (Tin Hill Social): BHLDN Suit: Centre Shirts Manufacturer While some people prefer to take traditional routes when tying the knot, others use their weddings as opportunities to make the big day truly special and unique. 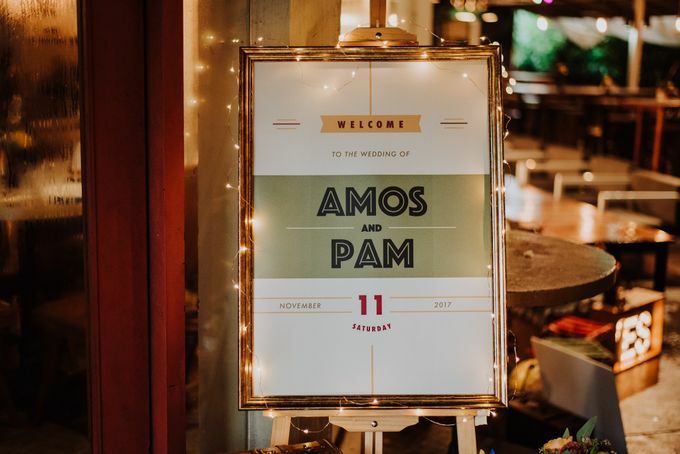 Amos & Pam decided to ditch the normal nuptials and opt for a wedding inspired by their favorite film director. 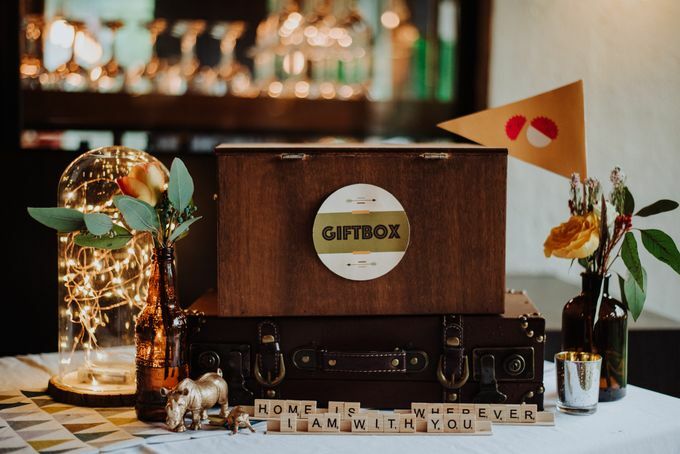 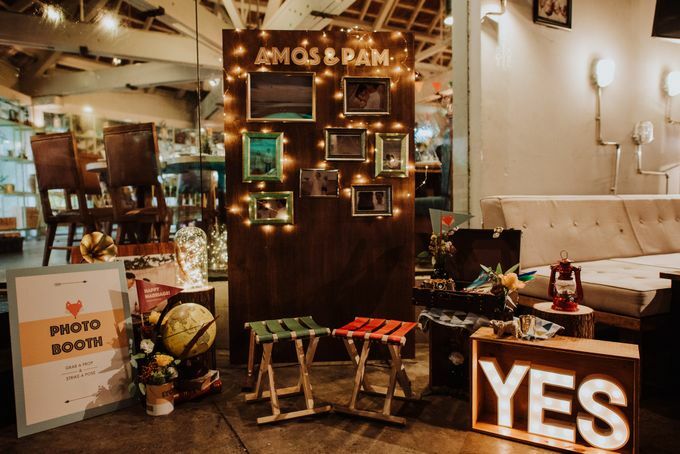 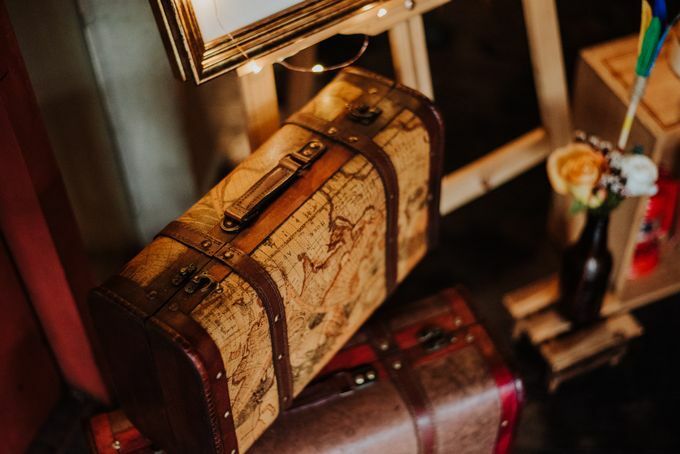 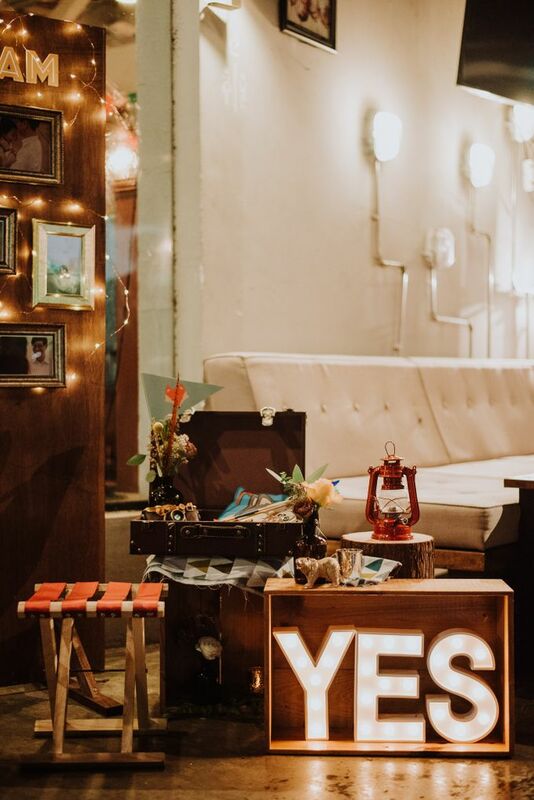 Eclectic and quirky is how we would describe the couple and their wedding theme! 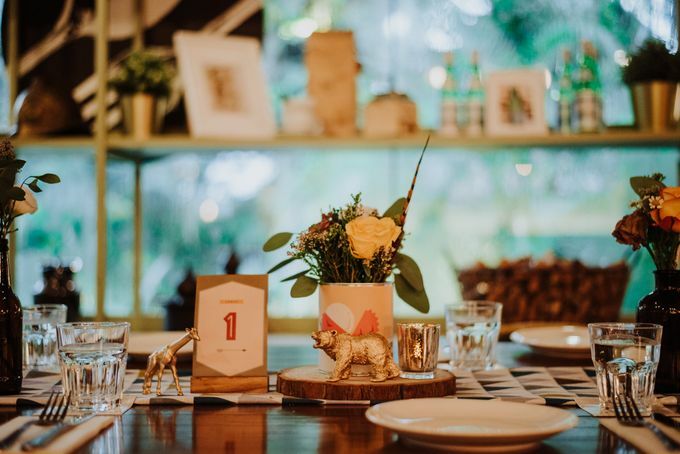 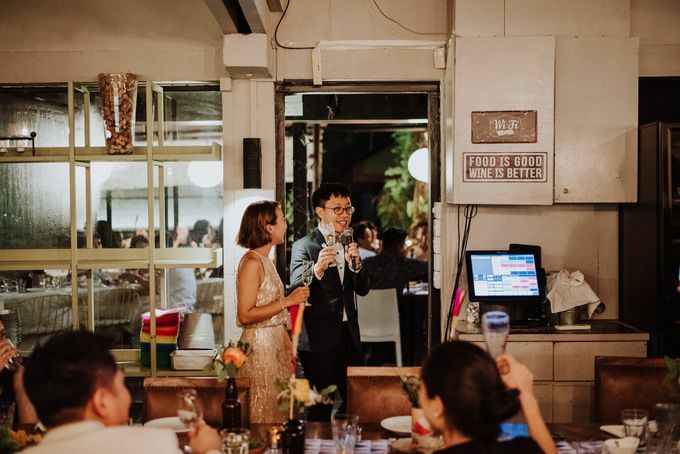 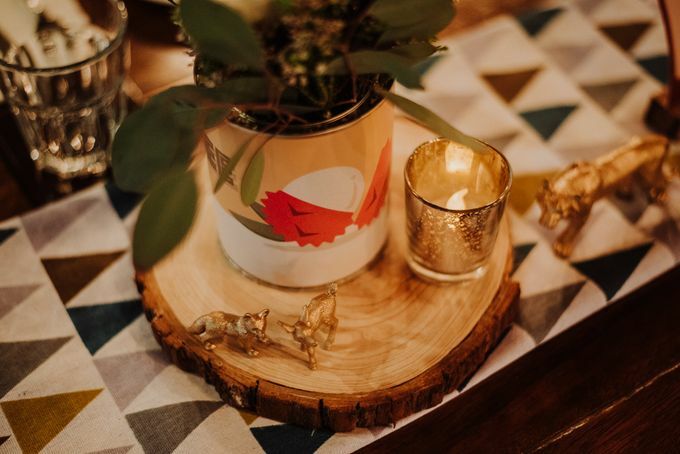 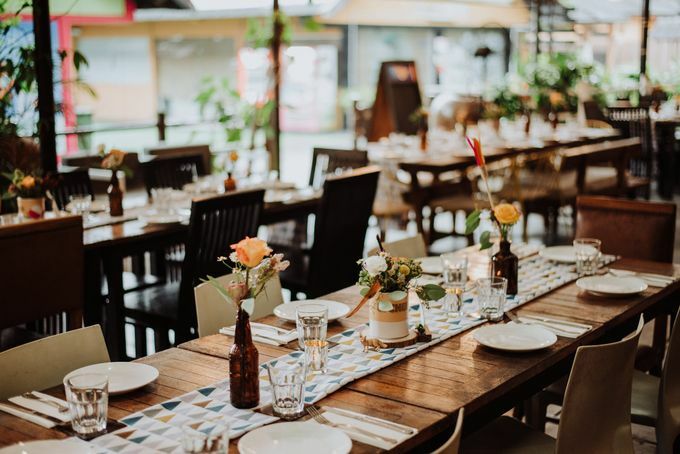 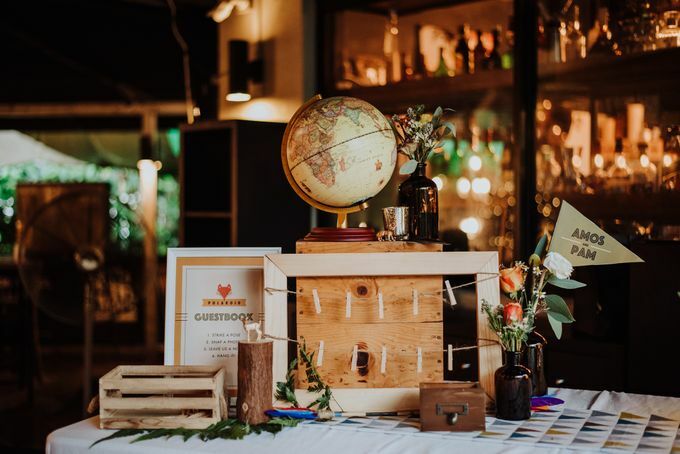 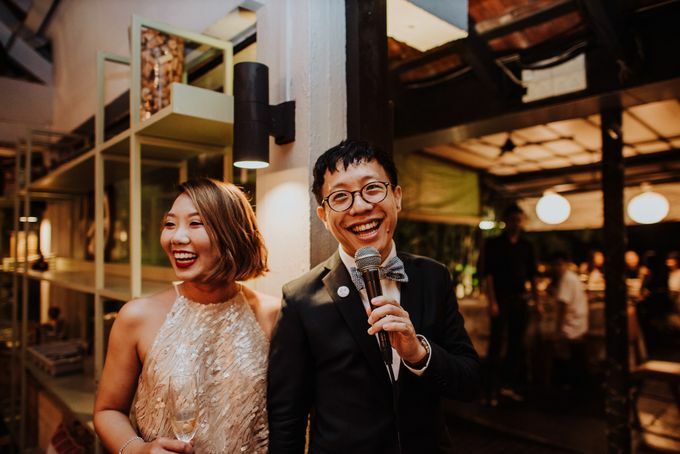 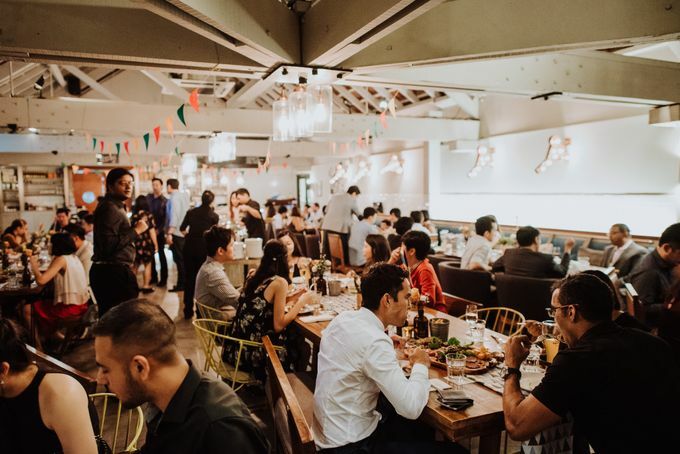 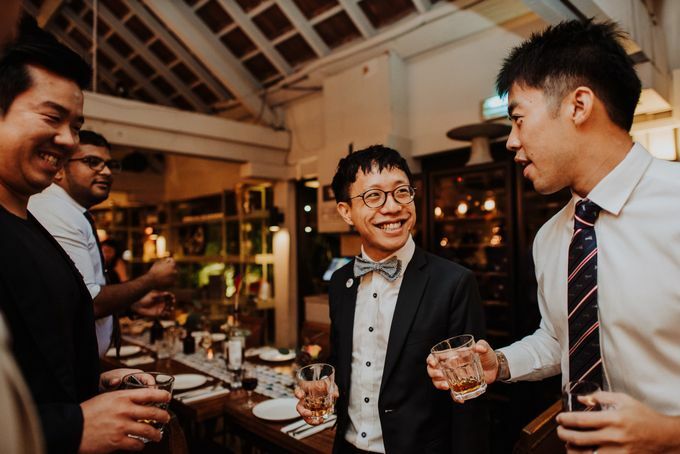 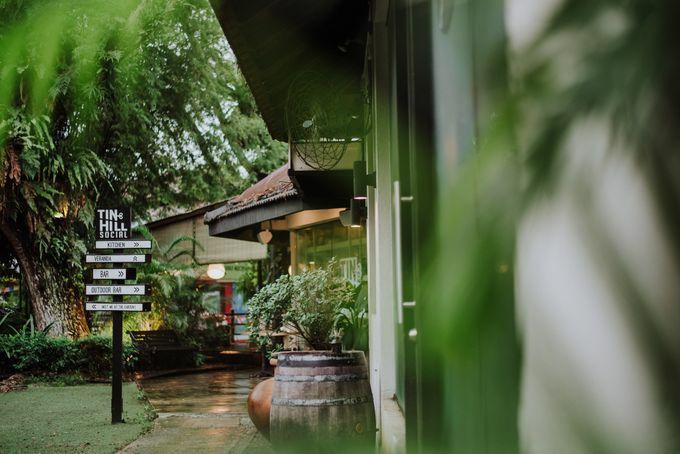 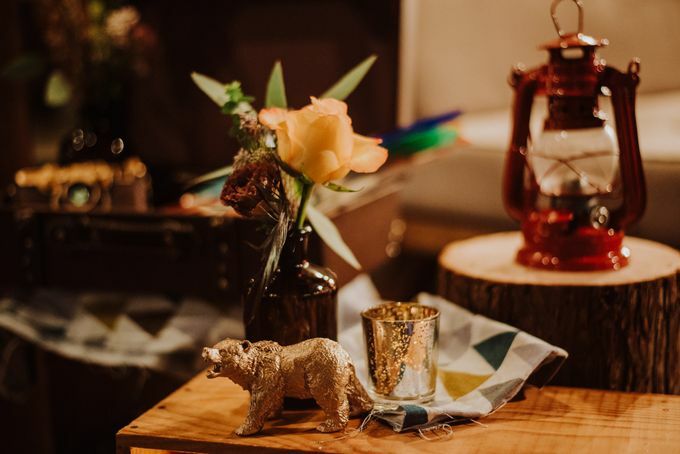 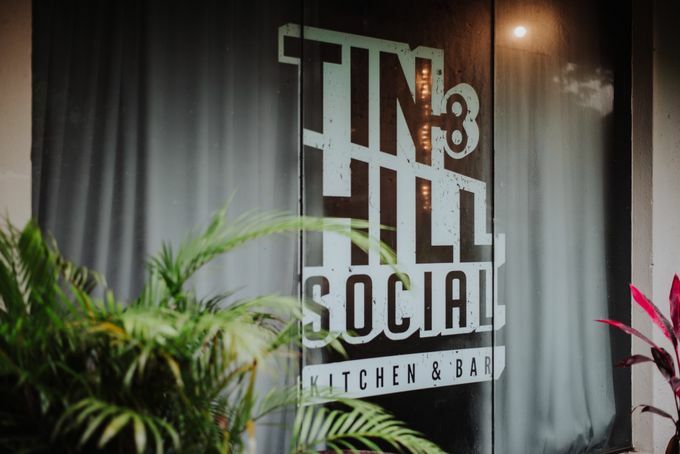 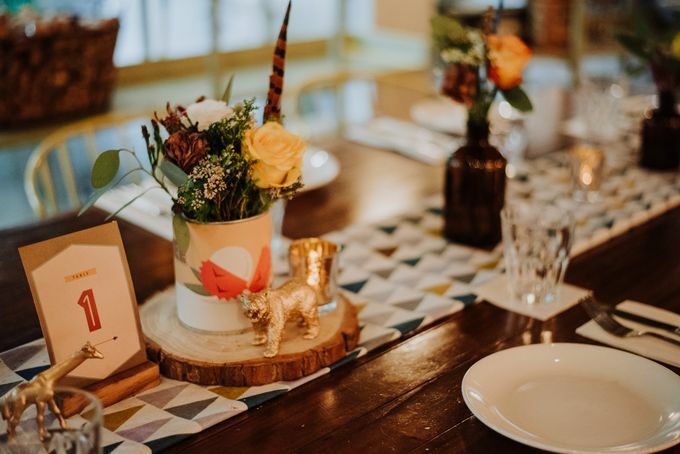 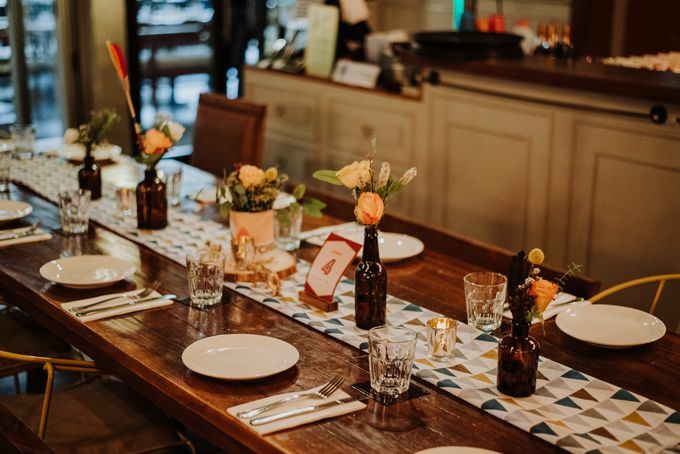 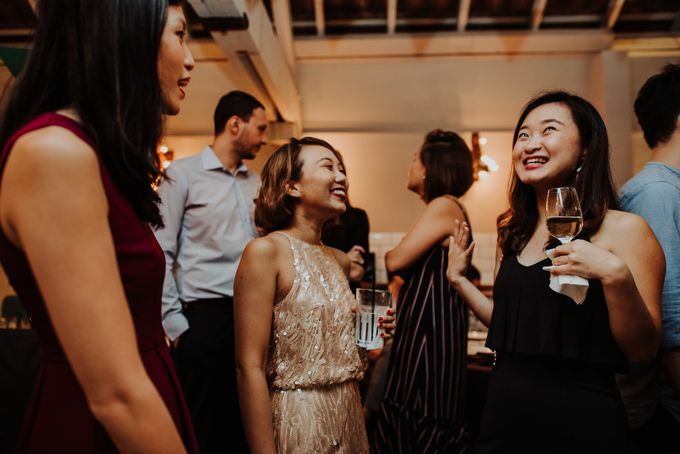 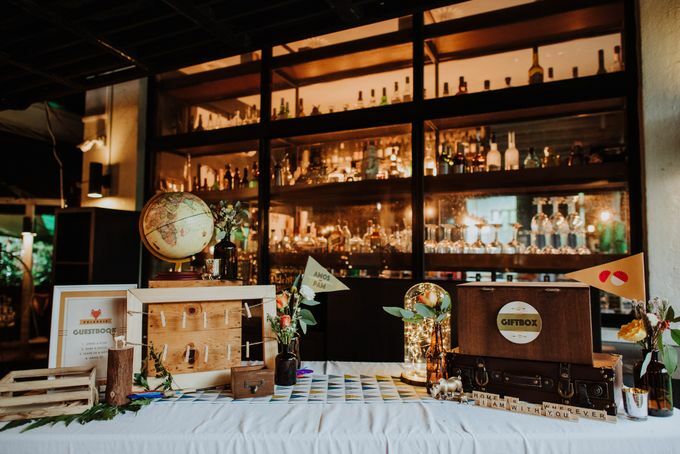 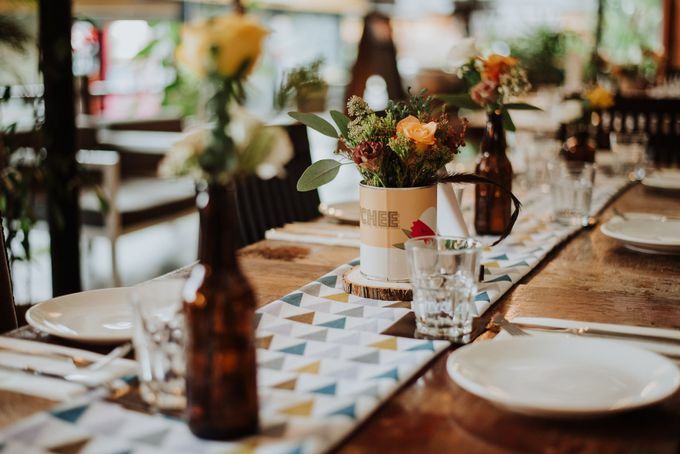 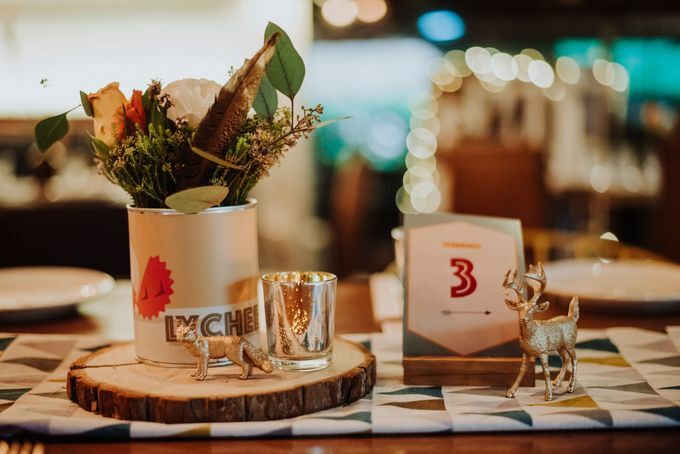 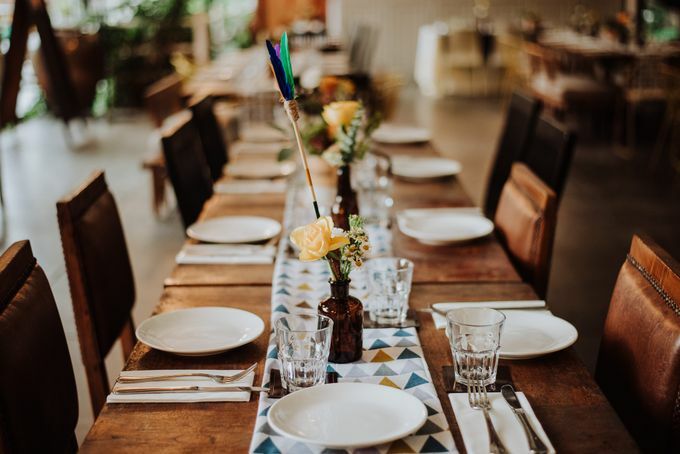 The fresh spring color palette included vivid teal blue, mustard and burnt orange which contrasted nicely with the all the greenery and dark wood furniture of Tin Hill Social. 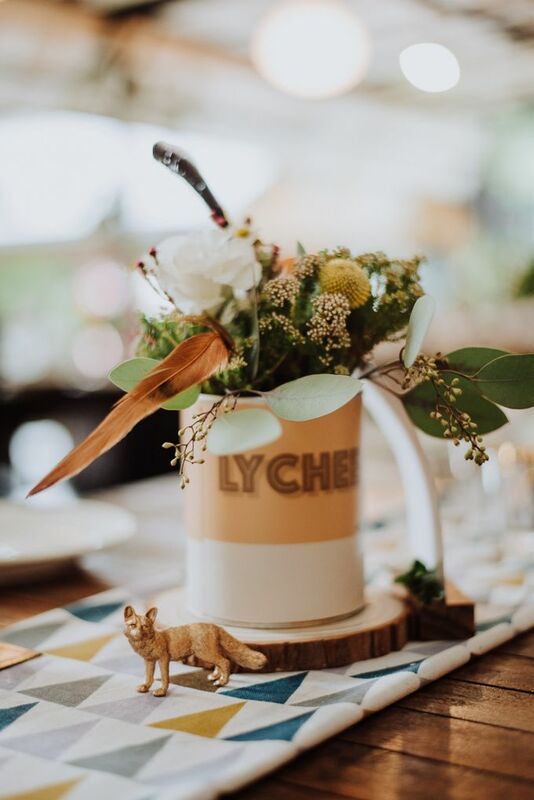 For their wedding, we chose to use flowers sparingly, focussing more on handcrafted details! 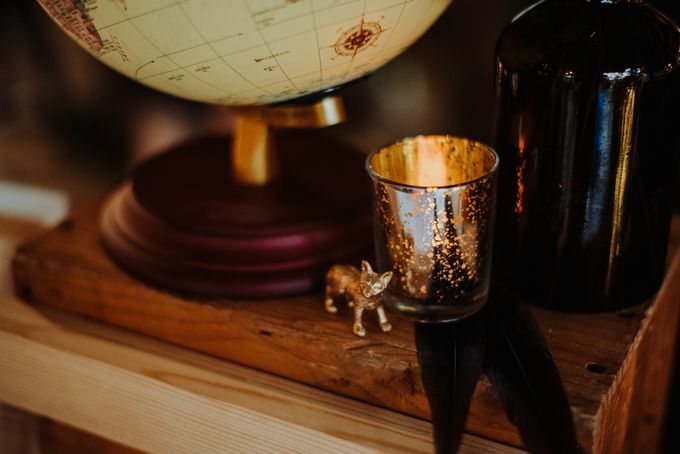 Animal figurines were sprayed to gold and added to the décor display. 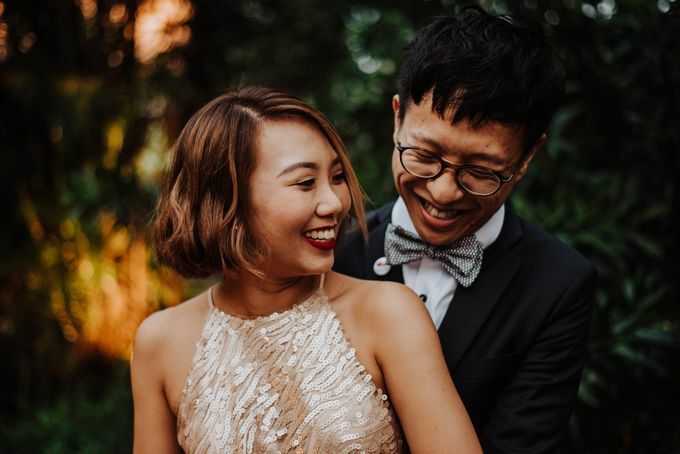 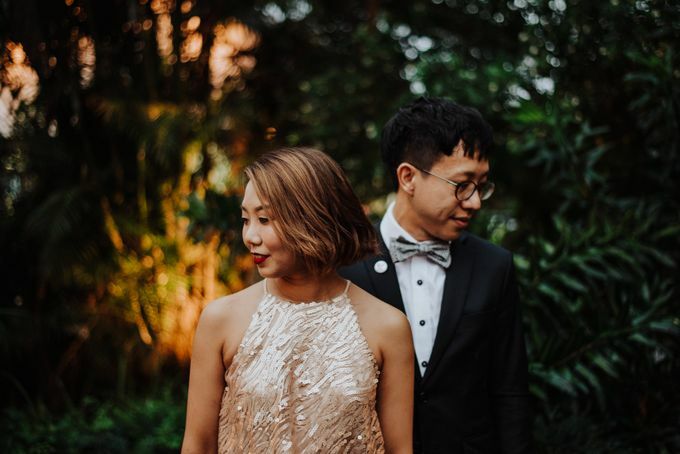 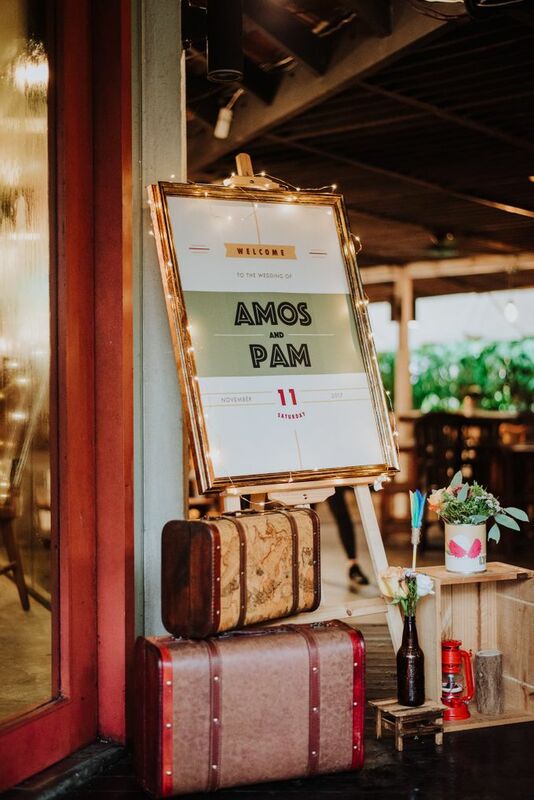 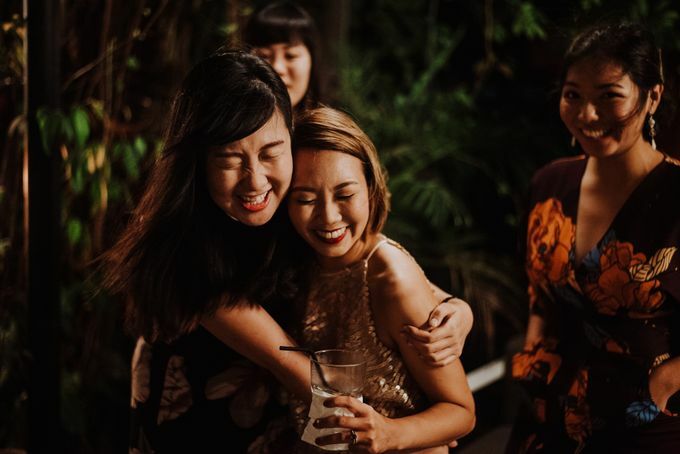 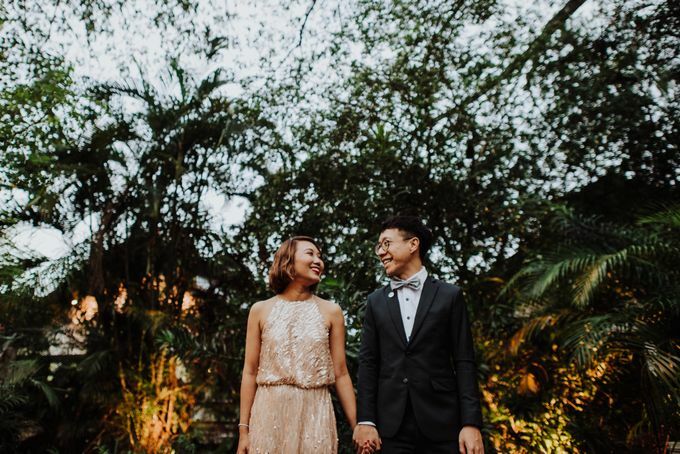 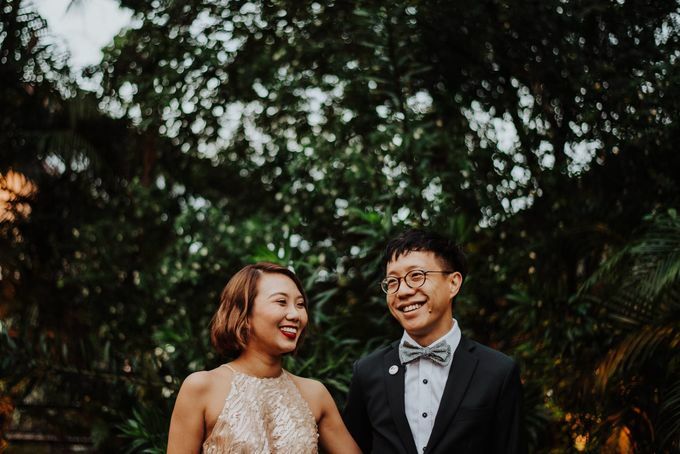 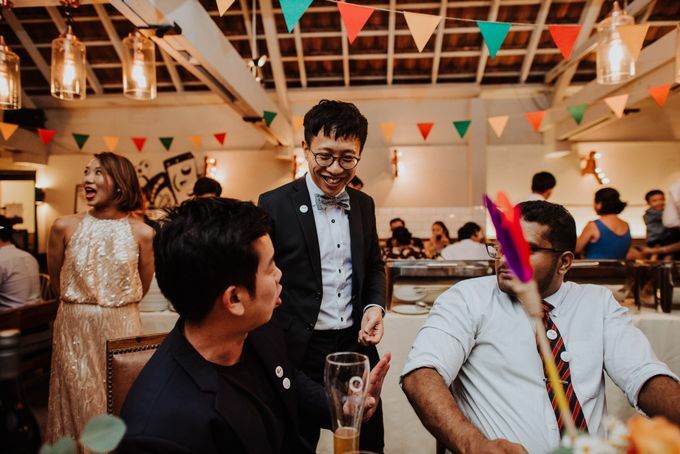 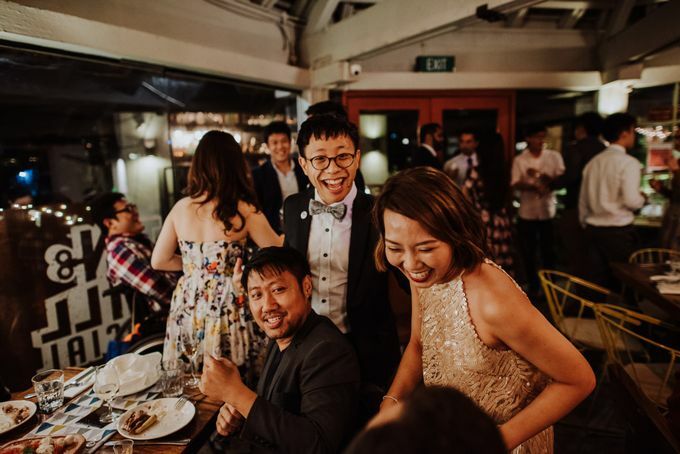 Pam requested to add in lychee as part of the element of the styling as it was a special fruit to her – she was eating lychees when Amos proposed! 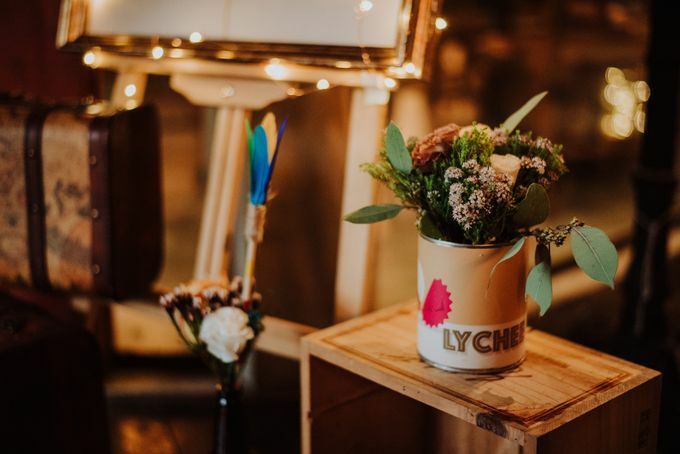 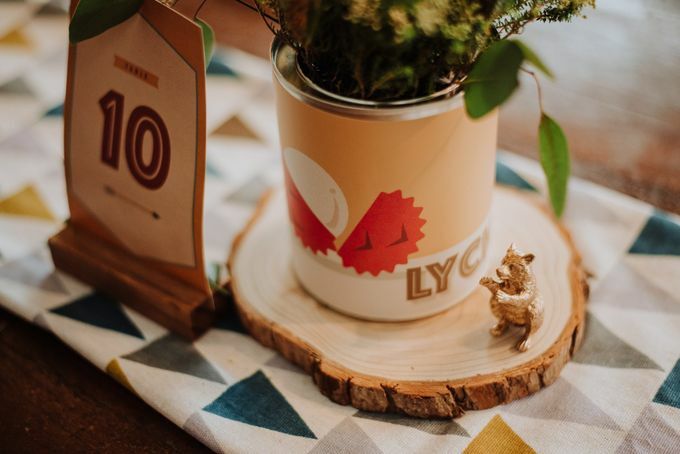 The Creative team designed and printed the lychee artwork on stickers and wrapped it around the metal tins used for holding the flowers! 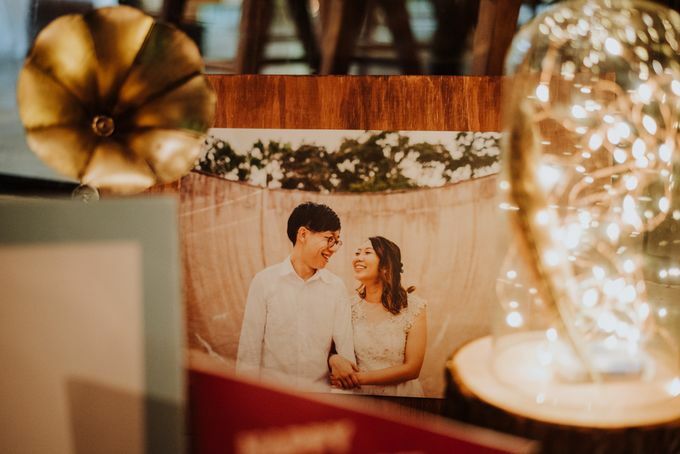 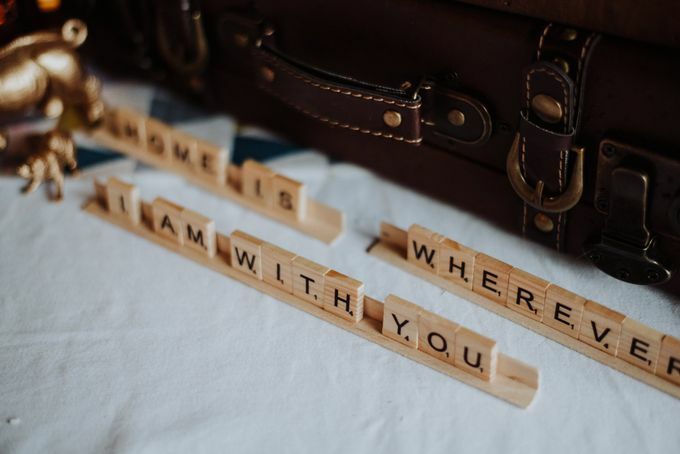 We love how the couple shared their love story with us so that we can include personalized details in the set up! 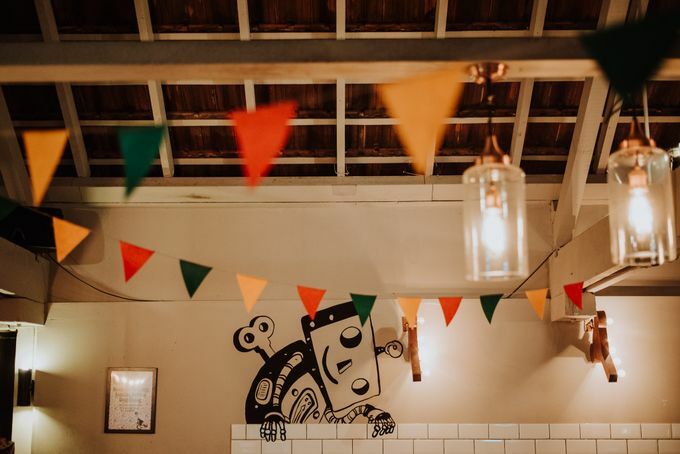 Overhead décor works best for venues with low ceilings! 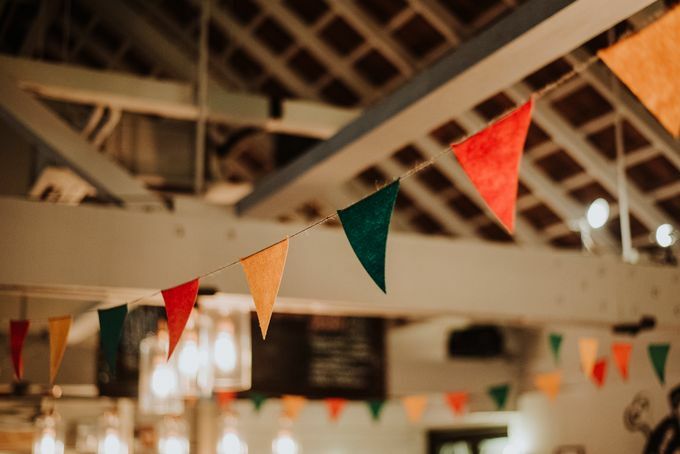 Thus, the team handmade the buntings in thematic colors for a more festive look! 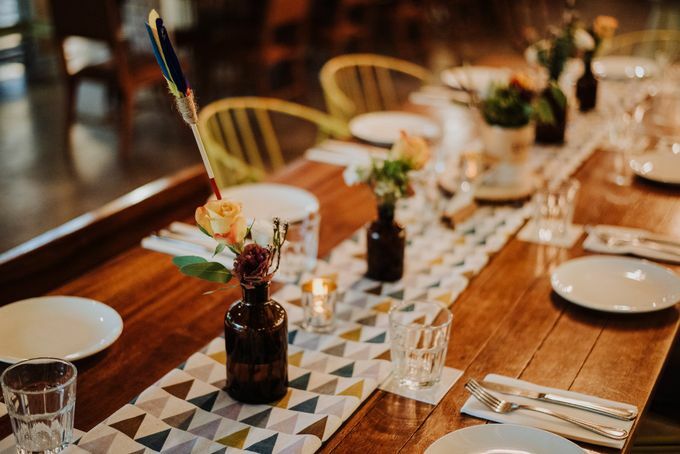 The brightly patterned table runner creates a focal point for the floral centre pieces too! 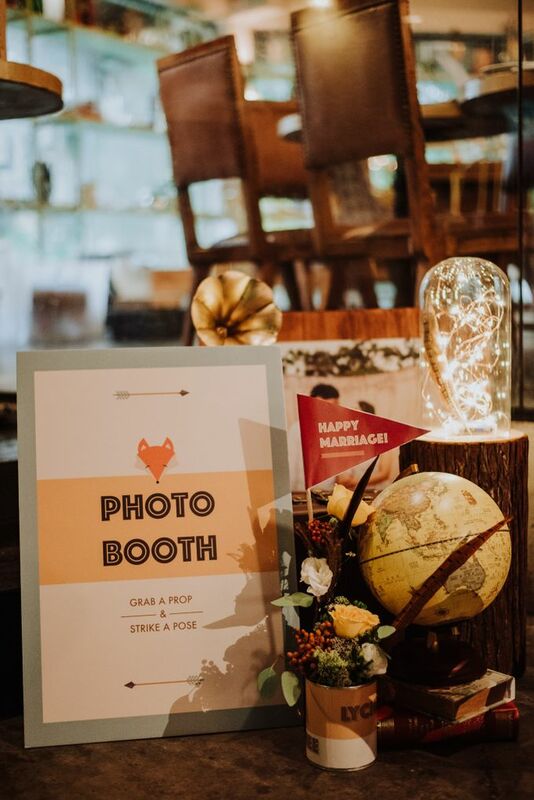 The main highlight of the space styling is the photo display area which doubled up as a photo taking spot for the guests! 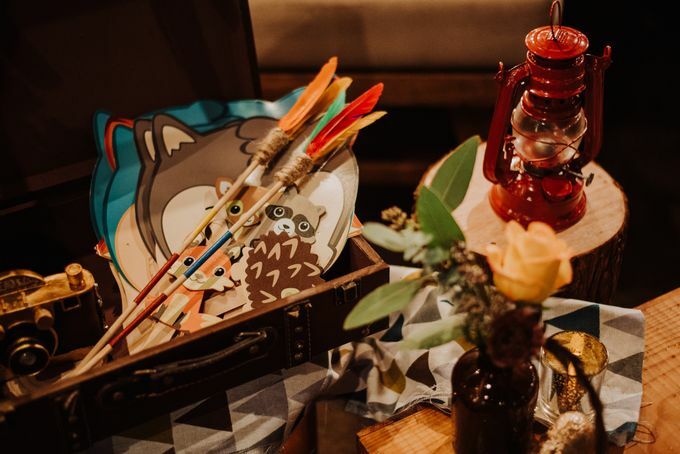 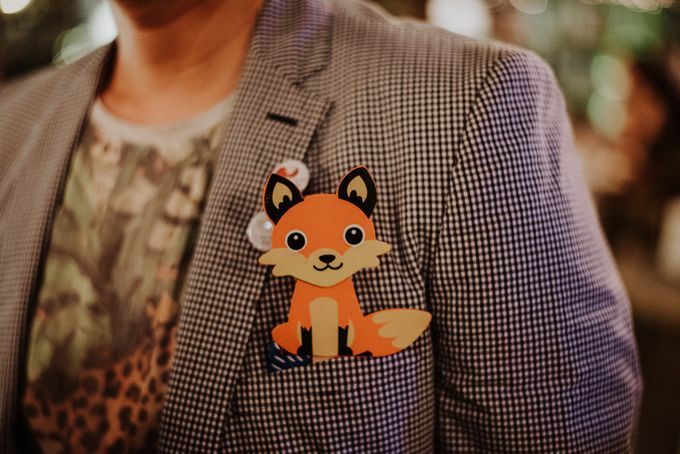 Having a themed wedding is just so much fun!